After my christmas ornament mani I did one with little white christmas trees on red nails. But to be honest, I wasn’t satisfied. The trees on the left hand looked ok but not great and on the right hand I stopped painting trees after the first turned out to be, well, lets not talk about it. This week Idecide to keep my mani low key. I just wanted pine green nails. But the polish seems to be rather bad because even with a topcoat I had tipwear already this morning. And because I needed concealer I was in the make area at my local drug store meaning I had to stop and check on nail polishes as I usually do. 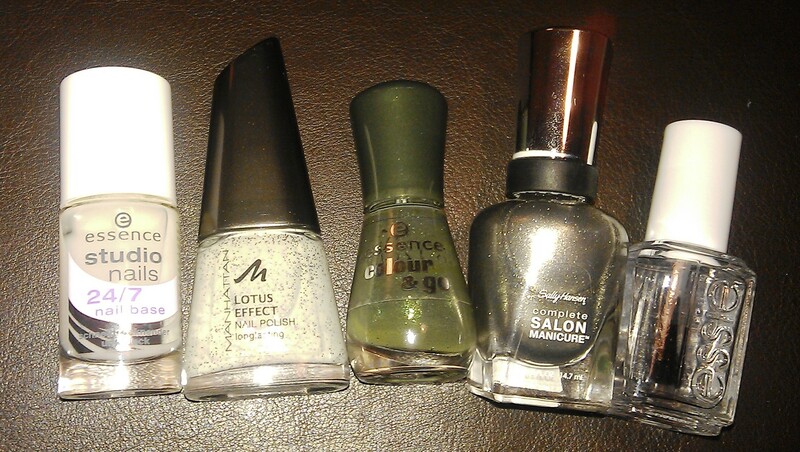 Now I promised myself not to buy nail polishes anymore this year. At least not more than one per month. In November I got the super lovely Before Sunrise from P2. Oh, and I completely forgot that I got essie’s chinchilly at work… And this month… well, I came out of the shop with three new polishes. And because I had already tip wear I used two of them to cover that up and create a mani that I’m constantly staring at, at the moment. To me it looks christmassy for the dark green and the shiny dots and a little bit like British granny chic because the glitter in the mint green look more like a tiny mille fleur pattern than glitter in this context. Creating it was easy: I turned a normal manicure in walk on the wild side by essence into a french one by adding a line in 71S from Manhattan. This is a creamy mint with tiny red, gold and green glitter which gives a look that is a bit weird but quite cool too. And because I had to paint it with the actual nailpolish brush and that didn’t go totally smooth and clean, I decided to add some brassy little dots from my very first Sally Hansen polish 677 Shoot the Moon. With the dots you dot see that the French top is not completely smooth. I like it but I don’t think it’ll last so I think I’ll pack some nailpolishes for when I leave for my christmas travels. Maybe I find the time to do my nails with a last christmassy design. This entry was posted in Nail Art and tagged 71S, Christmas, Dotted Mani, essence, French Nails, Manhattan, Nailpolish, Sally Hansen, shoot the moon, walk on the wild side by kathatravelling. Bookmark the permalink.